Despite was introduced and popularized since the early 1990s, it has not been a lot of farmers who use Azolla plant (Azolla pinnata) for his farming business. In fact the benefits of aquatic plants this one quite a lot. In addition to the media for ornamental plants and fertilizer, Azolla can also be used to feeding livestock and fish. Because it is considered weeds, then farmers get rid them. In fact, when used as a fertilizer in paddy rice, Azolla can suppress the use of urea up to 65 kg / ha. Utilization of Azolla as fertilizer is indeed possible. Because, when calculated from the dry weight in the form of compost (dry Azolla) contains elements of Nitrogen (N) 3-5 percent, Phosphorus (P) from 0.5 to 0.9 per cent and potassium (K) from 2 to 4.5 percent. While the micro-nutrients such as calcium (Ca) 0.4 to 1 percent, Magnesium (Mg) 0.5-0.6 percent, ferrum (Fe) 0.06 to 0.26 percent and Mangaan (Mn) 0.11 to 0,16 percent. Based on the chemical composition, when used for fertilizer maintains soil fertility, per hectares required of Azolla Some 20 tons in the form of fresh, or 6-7 tons of compost (water content 15 percent) or about 1 ton in the dry state. When Azolla is given regularly every season, then one day it does not require soil fertilizers again. This is possible, because the stocking first quarter of an element that contains Azolla directly utilized by the soil. Quarter section, equal to 65 kg of urea. In the growing season of the 2nd and 3rd, Azolla substituting 1/4 - 1/3 doses of fertilizer. Compared to artificial fertilizers, Azolla is more environmentally friendly. How it works is also special, because Azolla is able to bind nitrogen directly from air. The using of azolla as a fertilizer, in addition to the fresh form, it could be in the form of dry and compost. In this form of compost, Azolla is also good for growing various types of media ranging from bonsai plants, maidenhair ferns, cacti until roses. For media ornamental plants, but used directly, Azolla can also be composted with sand and garden soil with a ratio of 3: 1: 1. To make compost Azolla, is easy enough. Just make a hole the size (L x W x D) 3 x 2 x 2 meters. And then, fresh Azolla is included into the hole. A week later Azolla dismantled. To reduce the moisture content to 15 percent, the Azolla has been fermented and then dried. After rather dry, freshly packed in a plastic bag or directly used as growing media. In addition to fertilizers and growing media, Azolla can also be used for animal feed, especially ducks and various kinds of fish. As animal feed, Azolla has nutrient content is quite promising. Content of protein, for example, reached 31.25 percent, 7.5 percent fat, 6.5 percent carbohydrates, soluble sugars of 3.5 percent and 13 percent crude fiber. 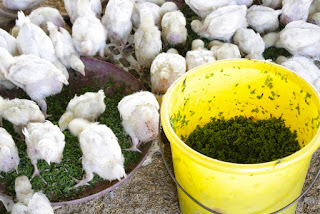 When used to ducks feed, the use of fresh Azolla (age 2-3 weeks) were mixed with feed ducks. Based on the results of research, 15 percent Azolla mixture into the ration, proved to be bad effect on the ducks. The production of eggs, egg weight and feed conversion also remained normal. This implies the use of Azolla can reduce 15 percent of the cost of buying ducks feed. Of course this is quite beneficial because farmers can reduce the cost of buying feed the ducks. Same as for ducks, when it will be used to fish feed, Azolla can be given directly in a fresh condition. Based on the review of the field, in fresh condition Azolla can be given to feed the carp, Tawes, tilapia and carp. By using Azolla as feeding, proved fish can grow rapidly. 0 Response to "Benefits of Azolla"